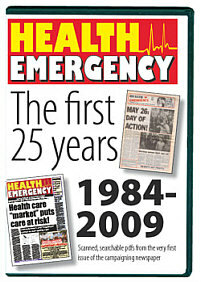 Celebrating the first 25 years of LHE's tabloid newspaper Health Emergency, this searchable DVD has scanned and electronic versions of all 66 issues produced to date. Track events in your local area, or just surf back in time to see some of the campaigns and issues that have come and gone since 1984. This DVD (files in pdf format) is available to union branches and individuals for just £25, institutions £100. Payment with order or by PayPal (click yellow button below). If you are paying by cheque, please make it payable to "London Health Emergency" and send (with your full postal address) to LHE, BCM London Health Emergency, London WC1N 3XX. 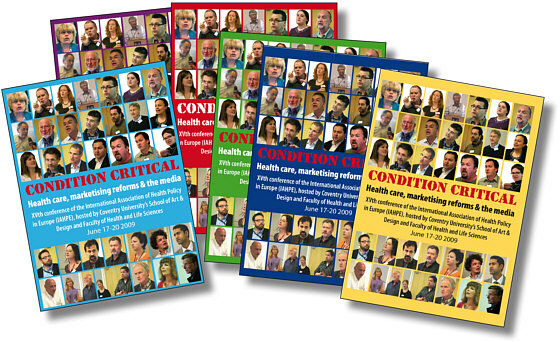 This 6-DVD set covering all of the presentations at the Summer 2009 Condition Critical conference is now available for just £35 including post and packing. The international conference, organised by the International Association of Health Policy in Europe and hosted by Coventry University, focused on "Health care, marketisation and the media". It was attended by delegations from 15 countries and heard 38 papers. Pay online via Pay Pal (click yellow button below), or send cheques payable to "Public Service Insight" (with your full postal address) to LHE, BCM London Health Emergency, London WC1N 3XX. During the mid 1980s, LHE developed a national database on the privatisation of hospital support services, and argued strenuously against the competitive tendering process, pointing to the negative impact of privatisation on the quality of patient care. This work grew too demanding for a London-based organisation, but we maintained our critique of the private contractors, and strongly supported union action to challenge the profiteers. More recently, John Lister of LHE has worked with UNISON nationally to research a detailed response by staff in both privatised and in-house NHS cleaning services to the "Matron's Charter" and other government guidelines on hospital cleaning. The report Cleaners Voices was published in January 2005 at UNISON's first ever national conference of hospital cleaning staff. 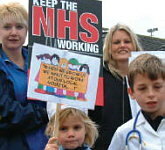 The pamphlet was researched by John Lister of LHE for UNISON as part of its Cleaner Hospitals campaign, 2005. LHE has always strongly opposed the creative accountancy and monopoly contracts associated with the Tory government's Private Finance Initiative, which has required all NHS development schemes since 1993 to seek private capital. The policy has now been embraced by the New Labour government, with a package of PFI schemes under way at a total cost of £6.5 billion. But the long term cost will be even larger, and PFI is a major factor in the reduction in numbers of hospital beds. With the first schemes already completed, mainstream NHS hospitals have, for the first time since they were nationalised in 1948, begun to be owned and run by private firms for profit - with the long-term additional cost to be borne by the taxpayer, and severe consequences for NHS staff and patients. 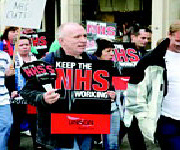 The PFI experience, Interviews with staff in nine PFI hospitals in England, Scotland and Wales. A hard-hitting 48 page pamphlet researched for UNISON by John Lister of London Health Emergency. Not So Great. Voices from the frontline at Swindon's Great Western Hospital. Another pamphlet based on interviews with staff and analysis of the history of a specific PFI hospital project. Reinventing the Flat Tyre, a response drafted for Central Manchester Community Health Council on the PFI scheme for Central Manchester and Manchester Children's Hospitals Trust, 2003. A Millstone Round Our Necks, an update on the implications of the Central Manchester PFI scheme produced for the Manchester Community and Mental Health branch of UNISON, summer 2004. A DEVASTATING report by private consultants for East London and City Mental Health Trust laid bare a whole raft of major problems that hit a new £12.5m mental health unit in Newham built using the controversial Private Finance Initiative (PFI). The report, a copy of which was leaked to London Health Emergency, makes it clear that the new building is too small, in the wrong place, poorly designed, poorly built, and suffers from poor quality support services from the private consortium. In 1990-91, LHE also worked with COHSE to develop the report Where's The Care? giving what was for six years the only detailed analysis of the gaps emerging in mental health services in the capital as the large old psychiatric hospitals on the outskirts of London began to speed up the closure of beds. Since 1997, LHE has worked with UNISON to research and publish two documents surveying the problems of mental health services, (The Credibility Gap, April 1997, and The Care Gap, May 1999). The second document gave the background for a major conference in central London, addressed by Health Minister John Hutton on May 27 1999.